Of course a few pretties and cutesies HAD to come home with me as a keepsake of our wonderful weekend. 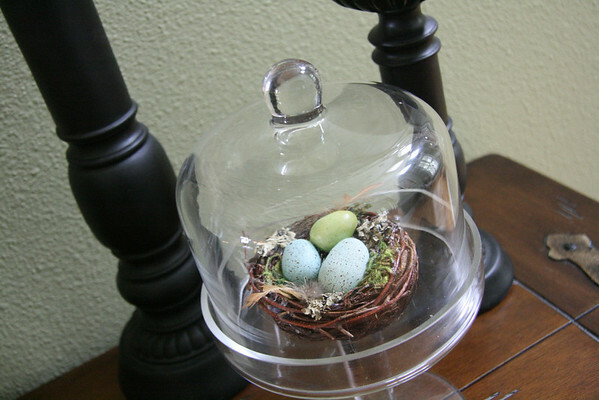 This bird's nest looks perfect under my glass dome thing-a-ma-jig. Isn't this wire thing FAB? It's perfect for clipping cute notes, cards or photos. I haven't decided on a place to hang it yet, so it's propped on the red dresser in our family room. I don't know...since I'm lazy and all, it just may have found it's permanent home. I clipped on an old postcard from a Smithville parade in the 1940s that Lynn generously shared and the little teapot invitation for the Mother's Day Tea Friday morning from Annelise. You will also see scattered in the bowl some of the blue and green eggs in with the pine cones already living there, along with a little clay bird nestled in her new home. Yeah, I'm not so sure about the pine cones AND the eggs, but I went with it anyway. This bird likes to live on the edge. 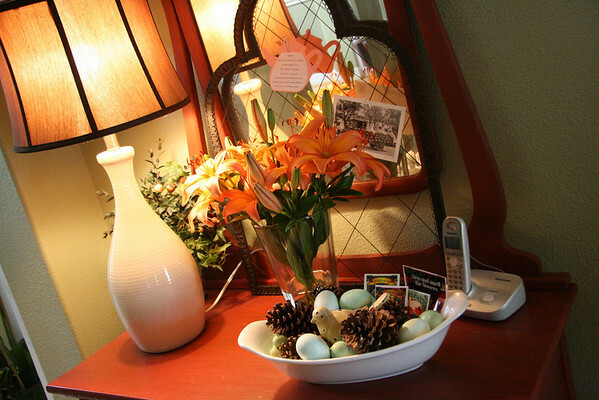 I must also point out my recent bribery to myself, the orange lilies. In order to make myself go grocery shopping I've been treating myself to flowers from HEB these last few trips. What can I day? They make me happy and the shopping a little more pleasant. I usually wheel my buggy over to the flower area first then proceed with my drudgery shopping. 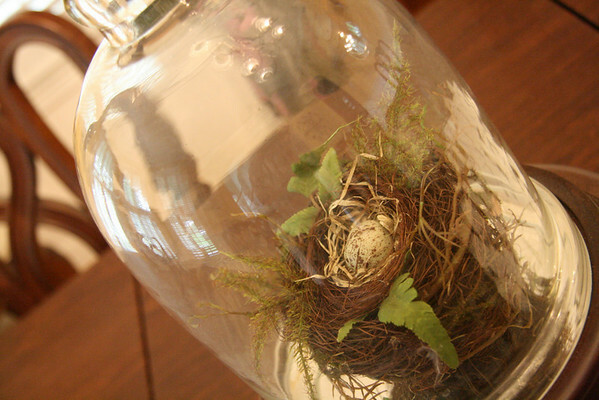 I also could not resist a teeny tiny bird's nest for glass thing-a-ma-jig #2. Finally, this darling fan came home as a little gift for Annelise. She was quite infatuated with its pinkness and its featherness. 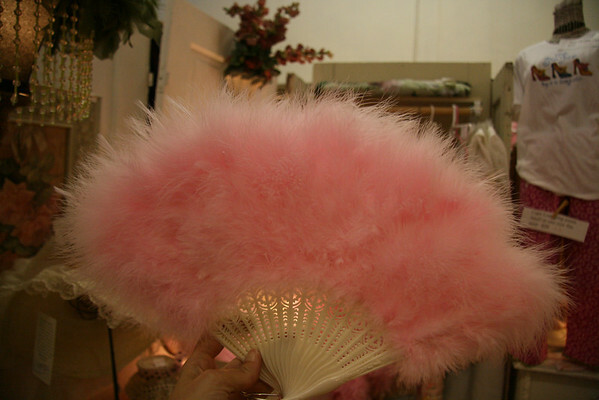 Doesn't every girl need a pink feathered fan? I think yes. I just caught up reading the trilogy of your very fun weekend. I am a small town girl myself, so I love a good small-town story...especially when it involves good food and good shopping. Fun, fun! You captured it all! And I don't want it to stop. Make sure you mention that I was not present in the 1940's just shared the card! LOL. It was a little over a decade later before I joined up! Then it was about 2 more decades before I joined that parade! But, I thought the postcards were so fun. I love the pinecone plethora in the bowl. It's very primitive and if I was a bird? Just where I'd live. You got some great deals. When are you coming back? Okay let's see...math wasn't my strong point. I guess it was more like another half decade when I joined the parade scene. That would make me 16? Or so. That's about right. Old as dirt but not as old as dirt if I was in the 1940 card! I think yes, too. What a great ending to your post - it gave me quite a chuckle. these are awesome. my personal favorite is the fan. that is ideal!